VANDALIA — If fans didn’t look at the scoreboard going into halftime, most would have thought the Butler Aviators held a sizeable advantage over the visiting Badin Rams in their first round playoff match-up. Unfortunately, the scoreboard is the only stat that matters. Despite dominating the Rams in most statistical categories, the Aviators couldn’t overcome five interceptions and a special teams breakdown that led to a 33-22 victory by Badin. Butler, the #4 seed in Division III, Region 12, finished the season at 6-5 while Badin, the #5 seed, improved to 8-3 and advance to face top seed Alter in the regional semifinals. Friday’s game was all Butler early. Badin’s took the opening kickoff and, after a controversial play that resulted in the Rams keeping the ball after an apparent fumble, Butler’s Bryan Johnson intercepted a pass that gave the Aviators possession at the Badin 40 yard line. Butler quarterback Mason Motter connected with Johnson for 12 yards down to the 28 on the very next play but a holding call would prove costly. Another pass from Motter to Johnson got the Aviators back to the original line of scrimmage but a loss on third down forced the Aviators to punt. Butler’s defense stood tall and a third down sack pinned the Rams to their own 2 yard line that forced them to punt. Butler took over at the 31 to set up their first score. On first down, Ryan Martin, who finished the game with 113 yards and a score, ran for 21 yards to the Badin 10. Martin got seven more yards on first and goal, but it was Motter who finished the drive off from a yard out with 4:02 to play in the first quarter. Andrew Boren kicked the extra point and the Aviators led 7-0. After forcing a three and out and a short Badin punt, Martin’s 24 yard return to the Badin 17 yard line had the Aviators in prime position to go up by two scores. Unfortunately, a Badin interception at the three yard line was returned to the 41 to turn the Aviators away. Butler’s defense stood tall again, however, and forced another three and out. After taking over on their own 40 yard line, the Aviators used 12 plays to march down to the Badin 7-yard line before the drive stalled. Boren’s 24-yard field goal kept Butler from coming up empty handed, though, and the Aviators led 10-0. A squib kick and return set Badin up on the Aviators side of the field on their next possession, and big runs by Davon Hartmann-Starks and Alex Delong set up a Delong score from 9 yards out to give Badin their first points. Special teams came back to haunt the Aviators on their next possession after a punt by Boren was returned 75 yards for a touchdown that gave Badin their first lead at 13-10, which would hold until intermission after another Butler mistake. After taking over at their own 19 yard line following the kickoff, the Aviators were forced to punt. The kick was dropped by the Ram receiver and Butler’s Nick Coyle jumped on the loose ball at the Badin 40 yard line to retain possession for the Aviators. Butler took advantage and drove to the 20 yard line, but the Rams intercepted a ball intended for Johnson in the end zone to preserve their lead. Butler took the opening kickoff of the second half and used 11 plays to march 61 yards before Motter scored from 17 yards out to reclaim the lead 16-13. The lead was short lived as Badin took the kickoff back to Butler’s 40 yard line. Aided by a pair of penalties, including an encroachment call on 4th and 2 at the Butler 11, the Rams took the lead for good with 3:29 to play in the third quarter. Following another interception, Badin’s Hartmann-Starks ran for 55 yards and then caught a touchdown pass from 30 yards out to take a 27-16 lead. A pick-6 by Luke Tabler with a 25-yard return for a score ensured the Aviators would not mount a comeback despite a late touchdown by Martin from 2 yards out to set the final score. 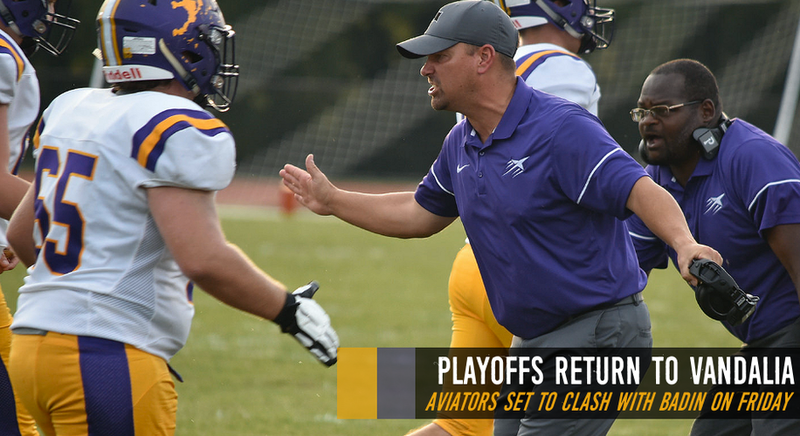 Despite a season full of key injuries, including the loss of Johnson and Quentin Glover for several games and the loss of Mike Masters, Puckett said the Aviators could have achieved more. 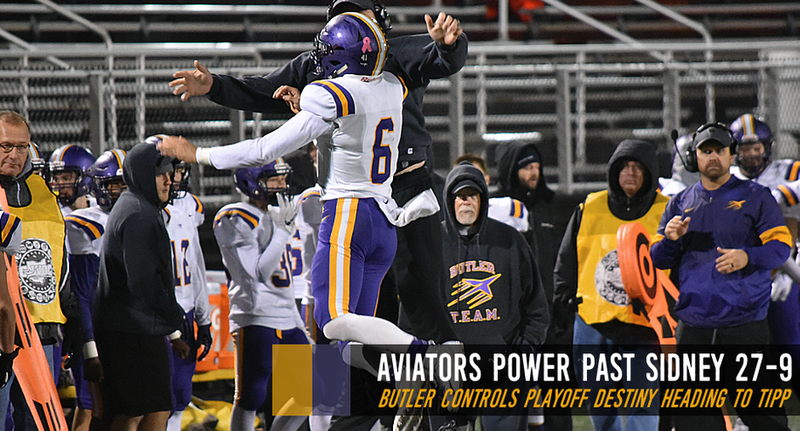 VANDALIA - It’s been both a memorable and historic season for the Butler football team this fall – and one that the Aviators hope to continue for a few more weeks. Hired in January, Head Coach John Puckett brought an intensity and mentality that quickly ignited the hopes and anticipation for the 2018 season. The buy-in from the players was immediate, and that has culminated into a winning season and an opportunity to host a home playoff game. “From day one they have done everything that I have asked of them,” said Puckett. The mantra “Fight Ready” was established early and it didn’t take long for the Aviators to embrace the culture that Puckett and staff were instilling. The result was a 6-4 regular season record, Butler’s first winning season since 2015 and marked the first time in program history that a first year coach has won six games. What’s more, the six wins were enough to earn the Aviators a first round home game in this week’s playoff game against Hamilton Badin. It will mark the first Week 11 action at Memorial Stadium since the 2002 season. It also marks the last time that Butler has won a playoff game. “Making the playoffs reinforces the things we have been teaching them since January,” said Puckett. Awaiting Butler is a tradition rich Rams team with a bounceback story of their own. While this will mark Badin’s 23rd trip to the playoffs, like Butler the Rams have not qualified for the postseason since 2015. Second year coach Nick Yordy has quickly gotten things back on track, leading Badin to a 7-3, 5-2 record and the GCL Coed Central Division crown. The Rams like to grind it out with the wishbone/double-wing offense, which features the explosive speed of halfback Davon Starks and the steady Alex DeLong. Starks has amassed 1,075 yards on the ground and 13 touchdowns. “We have to continue to run the football. We have to win time of possession. We want to get first downs and keep the clock rolling,” said Yordy in an interview earlier this season. 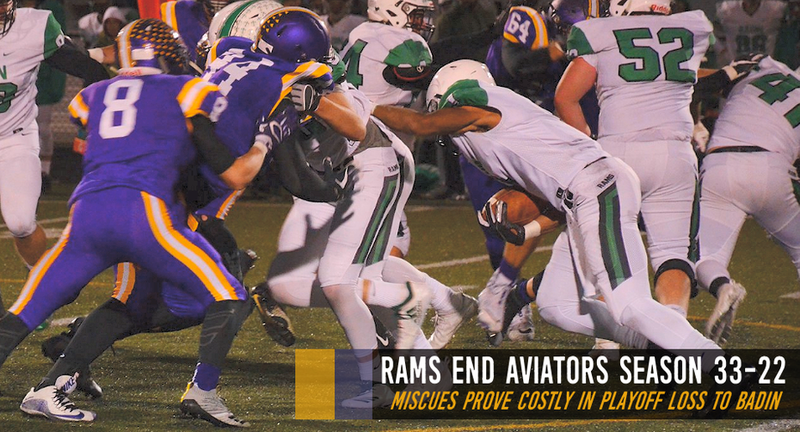 While the run game is Badin’s bread and butter, the Aviators will have to keep tabs on Rams’ quarterback Zach Switzer. Switzer has shown the ability to hurt teams from the air as well, throwing for 700 yards and nine touchdowns. Sound familiar? 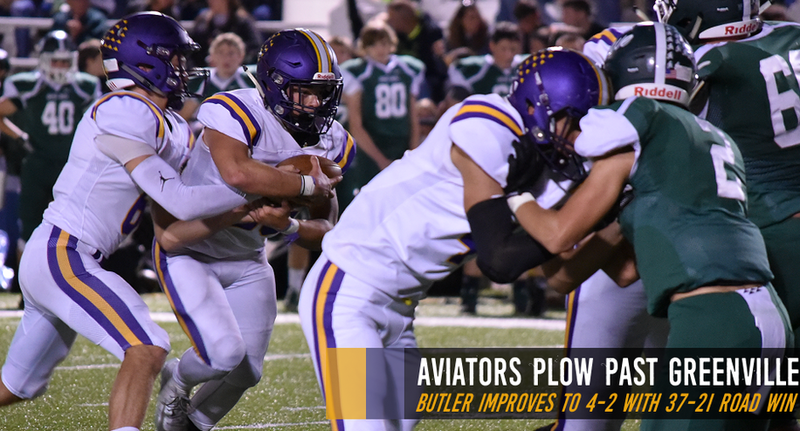 The Aviators offense brings a similar attack with Ryan Martin leading Butler on the ground with 1,064 yards and 16 touchdowns, while quarterback Mason Motter has added 676 yards and five touchdowns to the rushing attack. Through the air, Motter has thrown for 894 yards, five touchdowns and has been picked off only twice. Friday’s home playoff tilt will mark the just the fourth time in program history that Butler has hosted a first round playoff game. In the three previous home playoff games, Butler holds a 3-0 record with wins over Wapakoneta (55-9), Chaminade-Julienne (30-14) and Carroll (29-18). This is the eighth playoff appearance for the Aviators, who are 6-7 all-time in postseason play. The Aviators are 3-2 in the playoffs against GCL opponents, with wins over Carroll and McNicholas, a split with CJ and a loss to LaSalle. Regardless of what fortunes the playoffs hold for the Aviators, the extra practice and reps that the postseason affords is an invaluable advantage for the continued growth of the program. It’s also time with the players that Puckett cherishes. “This group has really made it enjoyable to go to work,” said Puckett. “Looking back on it from the first day of weights the kids are way ahead of where I thought they would be at this point but still far away from where we are going." TIPP CITY — A week ago, the Tippecanoe football team watched as a late seven-point lead slipped away in the final seconds in a one-point against Piqua. Friday night, the Red Devils did not allow a repeat. Tippecanoe capitalized on a first-half fumble recovery to take the lead and then scored an insurance touchdown early in the second half. 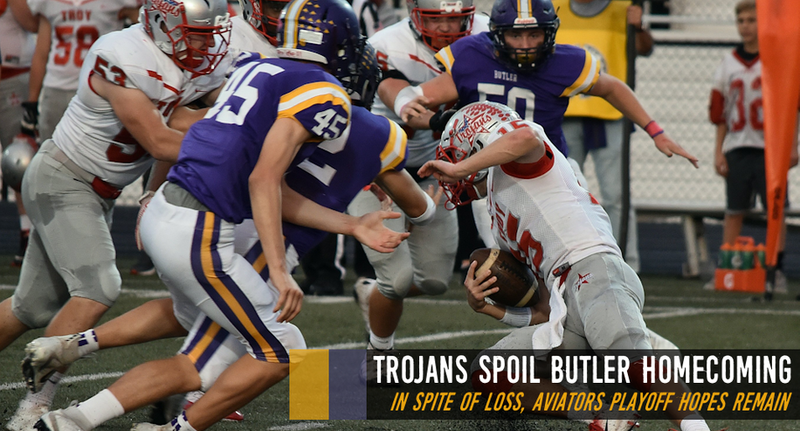 Butler answered with a fourth-quarter score to close to within six, but the Devil defense held off the Aviators from there in a hard-fought 20-14 victory in Friday night’s regular-season finale on Senior Night in Tipp City. The game was mostly played for pride, with Tippecanoe having already been mathematically eliminated from playoff contention for the second straight season and Butler having already clinched a playoff spot — but it still could have implications for the Aviators depending on a number of other results. Butler finished the season 6-4 overall and 3-2 in the Greater Western Ohio Conference American North Division. But entering the night, it sat in fourth in the Division III, Region 12 playoff standings, so the loss could theoretically cost the Aviators a home game in Week 11 — although that won’t be made official until Sunday and it didn’t appear likely. Tippecanoe, meanwhile, finished the year 5-5 and 2-3 in the GWOC American North. For the third straight week, the Devils had to play in a constant downpour, and early on that caused problems for both offenses. The ball slipped out of Butler quarterback Mason Motter’s hands twice on the game’s opening possession, including a fumbled snap on third down that led to a punt. But Tippecanoe’s Troy Taylor threw a third-down interception to Butler’s Brad Daily, handing the ball right back to Butler on the Tippecanoe 48-yard line. The Aviators’ drive stalled on fourth-and-7 from the Tipp 23, though, with a pass falling incomplete in the end zone — but on the ensuing Red Devil possession, Butler’s Nicholas Coyle stripped the ball from a Tippecanoe ballcarrier and ran it back 60 yards for a touchdown to give the Aviators the lead, 7-0 with 2:42 remaining in the first quarter. Tippecanoe forced a fumble on the first play of the second quarter, though, with Grant Heatherly recovering it on the Butler 33. And on third-and-7, Ben Ambos took the ball off the left tackle and found daylight, streaking 23 yards for a touchdown to put the Devils on the board — but a missed extra point, which proved costly in the one-point loss to Piqua the previous week, allowed Butler to maintain a 7-6 lead with 8:47 left until halftime. That lead didn’t last long, though. A big hit by Ambos on the ensuing kickoff return sent the ball flying, and the Devils recovered again to set up shop on the Butler 25. A 23-yard run by Jackson Yeager on the first play set up a 1-yard touchdown run by fullback Cade Beam two plays later, and the Devils held their first lead of the game at 13-7 with 7:28 left in the second quarter. The teams traded punts the rest of the half, and Tippecanoe maintained a tenuous six-point lead. Josh Burritt gave the Devils some much-needed breathing room, though, scoring on a 15-yard run in the third quarter to put Tippecanoe up 20-7. Butler’s Ryan Martin punched in a 2-yard touchdown with 4:09 left in the game to get back to within one score, but the Devils were able to bleed off enough of the clock to hang on for the victory. Butler’s offense outgained Tippecanoe 293-231 on the night but only found the end zone once against the Red Devil defense. Motter led the Aviators with 123 rushing yards on 31 carries, but the Devils’ secondary shut down the passing game as Motter was 9 for 24 for 78 yards. Martin added 92 yards and a touchdown on 92 carries. Tippecanoe, meanwhile, had four different running backs with 40 or more yards: Burritt had 65 yards on five attempts, Yeager had 62 on seven carries, Ambos had 54 on six carries and Beam had 40 on 11 carries. SIDNEY – Despite pulling off the longest run of his high school career Friday night, Vandalia Butler senior Nicholas Coyle won’t be lobbying coach John Puckett for carries. If his 59-yard touchdown run after stripping a Sidney running back deflated the Yellow Jackets … which it did … imagine what it did to Coyle. The senior linebacker isn’t used to running such distances, well at least not with people chasing him. Coyle did both Friday night in Butler’s 27-9 victory over Sidney that nearly solidified a spot in the Division III, Region 12 postseason. Butler (6-3 overall, 3-1 Greater Western Ohio Conference American North Division) moved up one spot to No. 4 in the computer points. A win next Friday against Tippecanoe likely gives Butler a home playoff game. Sidney (4-5, 1-3 GWOC American North) missed an opportunity to potentially finish with consecutive winning records for the first time since 1995-96. Sidney now attempts to avoid a losing record next week against Greenville. Sidney stuck around for the better part of Friday’s game. But it was Coyle’s grab-and-go touchdown late in the third quarter – which resulted in the Yellow Jackets’ fourth turnover – that proved too much to overcome. Sidney freshman E.J. Davis took a hand off around the left end, and was met by Coyle near Butler’s 40-yard line. Coyle – all in one motion – ripped the football out of Davis’ hands, secured it in his own and sprinted down the sideline. He had one defender to beat and did so but cutting to the inside near the 10-yard line. Coyle’s touchdown with 4:14 to play in the third quarter gave Butler a 20-3 lead. That play pretty much summed up Sidney’s night. The Yellow Jackets’ remained close to the Aviators, but just couldn’t run them down in the end. Sidney trailed 14-3 at halftime despite a lost fumble, fumbled punt attempt and two interceptions on its first four drives. Hailey Truesdale’s 26-yard field goal with 22 seconds before the half gave Sidney a boost. The Yellow Jackets then took the opening drive of the second half 66 yards on 14 plays … and all the way to the Aviators’ 15-yard line. The drive stalled on fourth-and-5 with an incomplete pass. Sidney quarterback Ryan Dunham completed 8-of-23 passes for 91 yards and two interceptions. A cold, hard on-again, off-again rain led to a few wobbly passes and a few drops, too. Dunham’s first interception appeared to slip out of his hand and the second was tipped by a defensive back right to another. Sidney pulled to 20-9 with 11:10 left in the fourth quarter on a Caleb Harris 3-yard touchdown run. The Yellow Jackets’ attempted an onside kick, which set up the Aviators’ on Sidney’s 49-yard line. The 1-2 punch of quarterback Mason Motter (19 carries for 125 yards, TD) and Ryan Martin (26 carries for 73 yards, 2 TDs) then wore down Sidney’s defense. Butler used six runs – capped by Motter’s 28-yard scoring sprint on fourth-and-1 – to restore the lead to 27-9. Butler finished with 201 yards of total offense. It wasn’t a lot – the Aviators ran just six offensive plays in the third quarter – but it got the job done. Motter also attempted four passes and completed one for two yards. Sidney had 232 yards, with 141 coming on the ground. Caleb Harris rushed 29 times for 108 yards and a touchdown. Butler still has an outside shot at sharing the American North Division title with Troy. Butler needs to beat Tippecanoe (4-5, 1-3 GWOC) and needs Piqua (6-3, 3-1 GWOC) to upset Troy (8-1, 4-0 GWOC). 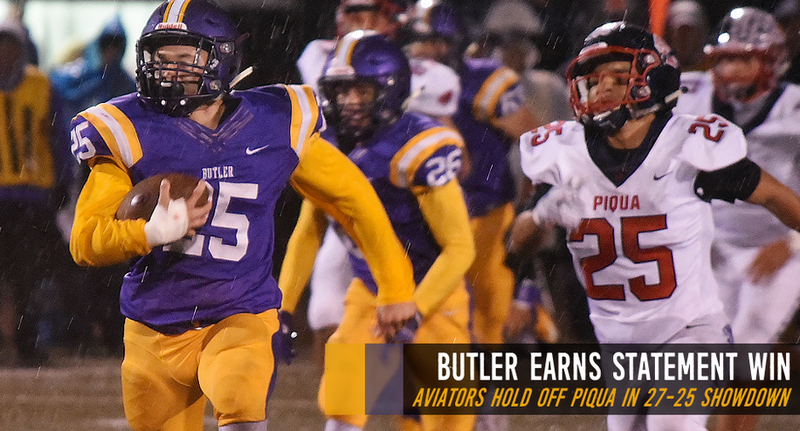 VANDALIA – Carrying a 27-0 lead into halftime, Butler turned the ball over three times in the second half and nearly gave away a key victory for its playoff hopes. Butler had the ball up 27-7 midway through the third after leading 27-0 at halftime in a downpour. The game looked in hand at this point. Piqua looked incapable of stopping the Aviators’ offense all night, with no punts forced or takeaways. Until now, because Butler senior quarterback Mason Motter fumbled the ball away at his own 30. Short field, easy Piqua touchdown. Alright, not a huge deal. Still up 27-13. Keep running the offense, avoid more costly mistakes and… another fumble three plays into the drive, on a zone read exchange this time. Piqua’s senior quarterback Micah Karn runs rampant like he’s done all second half and scores from 15 yards out on fourth-and-six. Okay, deep breath. The defense stopped them on the conversion attempt. Still up 27-19, with the ball, less than nine minutes left — wait, another fumble? On the jet sweep this time? At least the defense is stopping them short of the endzone this time, hemming up Karn to force third-and-long. Never mind, he broke two tackles behind the line of scrimmage, reversed field and went 23 yards for the touchdown, his fourth to go along with 141 yards on the ground. 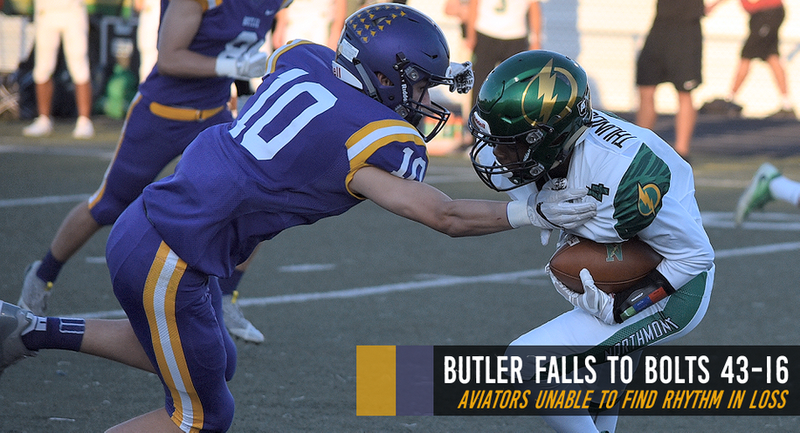 Thank goodness the Butler (5-3) defense held them short on the conversion try a second time, because if not this story might be about how the Aviators suffered one of their worst collapses in school history with playoff hopes on the line. They beat the Piqua Indians (5-3) 27-25 at home. Certainly in this case a win’s a win. Piqua is a playoff-caliber team Butler really needed a win against to keep its own playoff hopes alive. It’ll be a shoe-in if wins are grabbed over Sidney and Tippecanoe the next two weeks. That said, three fumbles over a span of five offensive plays is an inexcusable stat, rain or no rain. One series gives a perfect summary of Piqua’s first half. Facing second-and-11 at his own 34, Karn felt a blitz, scrambled, leapt out of the backfield and sprinted 20 yards downfield for the Indians’ second first down of the game. Of course, he took “leapt” too literally and hurdled somebody. The run was called back. Next play he scrambled again, fumbled and dove on the ball for a ten-yard loss. On third-and-31, Piqua ran the ball for a three-yard gain and punted the play after. 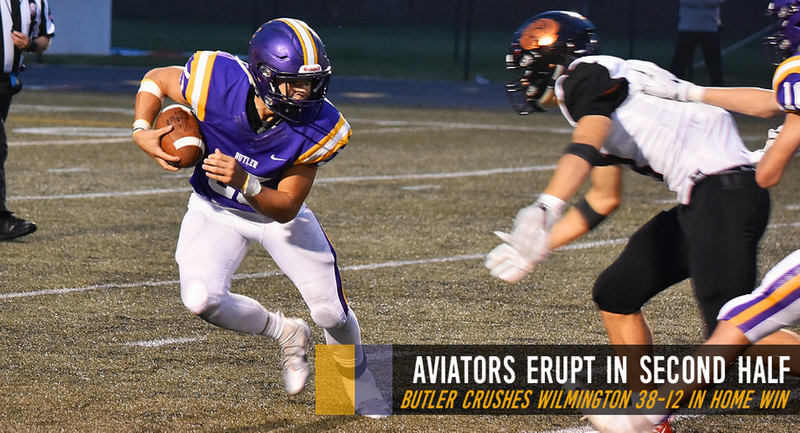 If that “drive” wasn’t indicative of the Indians’ overall futility against the Butler Aviators in the opening 24 minutes Friday night, nothing was. They totalled -10 yards of first-half offense. Again spelled out: negative ten yards of first-half offense. From the outset, Butler’s offensive game plan was clear: spread it out and run the ball. Despite running a shotgun formation, often with three or more receivers, Butler threw a grand total of _ passes on the night. Senior running back Ryan Martin and senior quarterback Mason Motter executed this plan to perfection. Most of Butler’s touchdowns came on extended drives: nine plays for 55 yards, 12 plays for 60, etc. As much was clear the opening drive of the game, when the Aviators ran the ball nine times from the shotgun, including on fourth and inches at the Piqua 35. Senior quarterback Mason Motter kept on a zone read, slipped a tackle, and weaved 32 yards through the defense. A one-yard scoring plunge by Martin three plays later made the score 7-0 Butler at the 7:08 mark of the first quarter. Piqua tried to replicate similar zone read magic on its first offensive play of the game, but the exchange was fumbled and recovered by Butler’s Jackson Akers. Butler marched 39 yards in five plays to extend the lead to 14-0. Martin strutted in from five yards out to make it so. “I love the way our offense played in the first half,” Puckett said. Piqua didn’t fumble its second drive. Instead they moved back two yards in three plays and punted. So Butler went 60 yards in a dozen plays with another fourth down conversion and a Motter touchdown run. 21-0. The Indians came back out, notched their first chain movement of the game, then punted three plays later. Remember above where it’s mentioned that Butler’s touchdowns came on extended drives with a relatively low average yards per play? Well, there’s an exception to that rule. Martin took a hand-off up the middle, made three defenders miss, bobbed and cut up the sideline to break off a 74-yard scoring run and make it 27-0 Butler before the half’s end. He finished as the star of the Aviators’ attack, racking up 139 yards on 23 carries with three touchdowns. Motter added 120 and a score on the ground, but also had a hand in the three fumbles. Piqua came out the second half and mounted a 70-yard scoring drive of its own on the legs of Karn, who scrambled 24 yards for a first down on a third-and-21 play then 17 yards for a touchdown to cap the drive and open up the fumbling, bumbling comeback bid. Butler’s players partied like it was 19 years ago after the victory, and rightfully so. This Piqua team is no slouch, with wins over teams like Sidney and Lima Senior already on the year. But rain, sleet or shine, they can’t commit turnovers at rates like that in the coming weeks. Too much is at stake. “When you get in that situation you have to get of the field and we did,” Shaffer said of the defensive stop early in the third quarter hat eventually led the Beyke’s touchdown run. “We talked in the locker room about being quick on defense and getting off the field so the offense can start putting some pressure back on them which we were able to do. Butler now returns home to face-off against Troy (5-1). VANDALIA — Butler and Xenia came in to Friday’s game with similar game plans – run the ball, run the clock, rely on defense, and grind out a win. Ultimately, that strategy paid off for Butler after a late Xenia touchdown forced overtime. After scoring on three straight runs by Ryan Martin, the Aviators led 13-7 after a failed extra point. It didn’t matter, however, as Butler’s defense forced the Buccaneers into a fourth down and 10 from their own 20 to decide the game. As it had most of the night, Butler’s defensive line overwhelmed Xenia’s offense to sack quarterback Christian Severt to end the game in dramatic fashion. 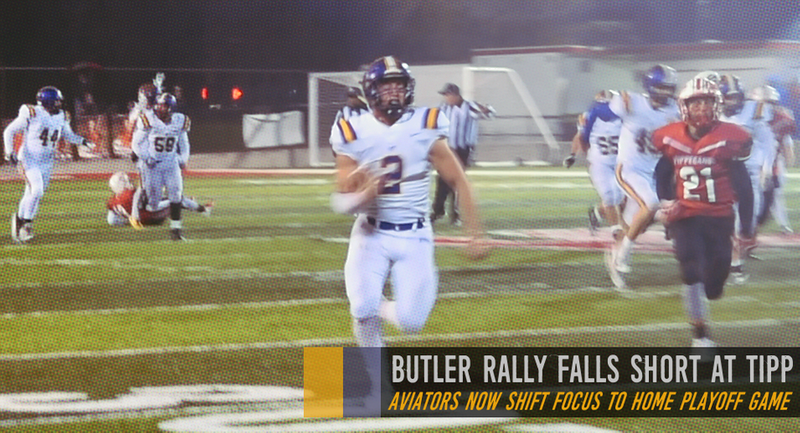 The win lifted the Aviators to 3-2 on the season and, more importantly, significantly boosted Butler’s playoff hopes. Xenia fell to 3-2 overall. The game was a battle of defense and field position from the start. Both teams forced a 3-and out to open the contest with Butler being the first to cross into the opposing side of the field late in the first quarter. The Aviators were forced to punt and had Xenia in a deep hole at their own 10-yard line but the Buccs methodically moved out to midfield. Facing a fourth down at Butler’s 42-yard line, Xenia looked as if they had a big play but at the last second Gavin Casella batted the ball away from a Xenia receiver to force the Bucs to turn the ball over on downs. After forcing another Butler punt, Xenia mounted its best drive of the game after starting at their own 20-yard line. The drive was aided by a big run by Sincere Wells and a late hit by the Aviators out of bounds. On third and goal, however, the Aviators forced a Xenia fumble which was recovered by Butler’s Bobby Buckler in the end zone for a touchback. “We got it moving there, but in a tight ball game, an inch here or an inch there…they (Butler) played a heck of a football game and came out on top,” said Smitherman. The Aviators capitalized on the Xenia error by flipping the field. Butler moved the ball to midfield, but their drive stalled forcing a punt. It was downed at the 13-yard line. Three plays later, Xenia punted and the ball was downed at Xenia’s 34-yard line. After gaining four yards on first down, Butler quarterback Mason Motter scrambled as time expired in the half and found Blake Ross for a 30-yard touchdown pass in the front left corner of the end zone. Andrew Boren kicked the extra point and the Aviators took a 7-0 lead, and seemingly, the momentum, into the locker room at half. The defensive struggle continued in the second half with neither team able to muster much offense, but when Butler turned the ball over on downs at the Xenia 41-yard line with 7:43 to play, the Bucs had new life. After a short gain on first down, Xenia took advantage of a lucky bounce to get an offensive spark. Despite the ball being tipped at the line of scrimmage, Severt connected with receiver Kevin Johnson to move the ball into Aviator territory. A key defensive holding penalty on third down kept the drive alive long enough for Wells to score from nine yards out with 5:09 to play to tie the score at 7-7. The Bucs forced a three-and-out for the Aviators, but after driving to the Butler 22-yard line, they turned the ball over on downs after an incomplete pass on fourth-and four with 0:06 on the clock. Content to settle for overtime, Motter took a knee. Xenia won the toss and elected to play defense first, and the Aviators fed the Bucs a steady dose of Ryan Martin up the middle. After a short gain on first down, Martin got the Aviators to third and inches. From there, a hole opened and he scampered into the end zone virtually untouched for what would prove to be the game winning score. Xenia will travel to Springfield (5-0) in Week 6 while the Aviators will travel to Greenville (3-2). VANDALIA – In past decades, the Northmont and Butler football rivalry may have crackled, but since the resumption of the game three years ago, the Thunderbolts have had the upper hand. That trend continued on Thursday night at Butler’s Memorial Stadium as the Thunderbolts (4-0) handed the Aviators (2-2) another thrashing in a 43-16 win. For the third consecutive season the game was featured on Fox 45’s Thursday Night Lights and for the third straight time Northmont used its size and athleticism to dominate Butler. In the three game stretch, the ‘Bolts have outscored the Aviators 126-29. Thursday night’s contest couldn’t have gotten off to a worse start for the Aviators. After taking the opening kickoff at their own 29-yard line, the Aviators went backwards thanks to multiple penalties and faced a fourth down and 32 yards to go at their own 5-yard line. Trying to punt, Butler’s Andrew Boren took a high snap off his hands and was tackled for a safety and a 2-0 ‘Bolt lead. “That’s why in a big game I hate taking the ball first,” said Butler head coach John Puckett. “I’d rather have a series, get everyone’s nerves calmed down, and give the other team a chance to make a mistake. Our special teams killed us tonight, and, to be honest, have been our Achilles heal all season long. On the ensuing kickoff, Northmont took over at their own 42-yard line and needed just three plays as Miles Johnson connected with Jazz Keys on three consecutive passes, including a 6-yard touchdown pass with 8:30 to play in the first quarter for a 9-0 lead. Johnson’s arm was accurate and deadly as he completed 12-of-17 passes for 322 yards and five touchdowns. Keys caught eight passes for 138 yards and a pair of touchdowns while Justin Golson caught just two turned both of them into scores and 101 yards of receiving. Northmont’s defense was dominant most of the night and forced Butler to punt. The Bolt’s wasted no time and took just three plays to take a 16-0 lead on a 70-yard pass from Johnson to Danny Lewis. Northmont took advantage of the absence of Butler’s deep-threat receiver Bryant Johnson who broke his collarbone in Week 3 versus Wilmington. “When he’s in the huddle everyone is more confident – the quarterback, the play caller – he stretches the field and creates opportunities for the run game,” said Puckett. 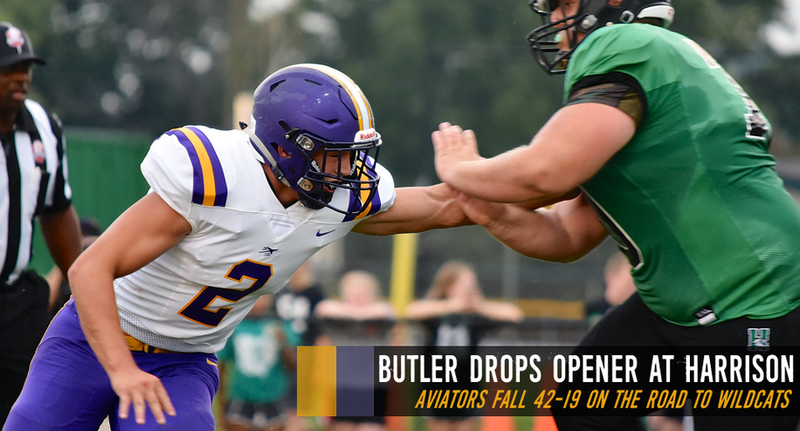 The Aviators got back in the game midway through the second quarter after a 12 play, 73-yard drive was capped off by a 17-yard touchdown run by quarterback Mason Motter that cut the score to 16-6 after Butler’s 2-point conversion failed. Unfortunately for the Aviators, the last seven minutes of the half belonged to Northmont. Johnson connected with Keys on a botched play from 47-yards out with just under five minutes remaining in the half to up the lead to 23-6. Johnson scored from a yard out two minutes later following a blocked punt to extend the lead and then, after taking over on their own 21-yard line, the Thunderbolts went 79 yards in just five plays to take a 36-6 lead at the half on a 25-yard pass from Johnson to Justin Golson with just five seconds left in the half. Northmont extended the lead to 43-6 late in the third quarter on a 76-yard pitch and catch from Johnson to Golson down the right sideline. Butler scored 10 points in the fourth period on a 26-yard touchdown pass from Motter to Blake Ross with 8:47 left and a 29-yard field goal by Andrew Boren with 3:49 to play. Northmont will travel to Wayne (3-0 pending Friday’s game) while Butler will host Xenia (2-1) in Week 5. A season ago, the Warriors came to Northmont and pulled out a double overtime win 38-35. Puckett said the loss will make his Aviators look inward. “The only way we get better from this is to be honest with ourselves,” said Puckett. VANDALIA – Ryan Martin rushed for 121 yards and four touchdowns, all in the second half, to lead Vandalia Butler to a 38-12 victory over Wilmington Friday at Memorial Field at Miami Valley Athletic Complex. Butler’s home opener was also their annual Play for a Cure game that honors former Aviator Blake LaForce, an athlete and 2009 graduate of Butler, who passed away from complications following a battle with leukemia. The Aviators (2-1) scored on three straight possessions in the fourth quarter – two of them by Martin and another by quarterback Mason Motter – after the Hurricane drew within 17-12 on the first play of the period on a 5-yard touchdown pass from Brady Evans to Cameron Coomer. Martin’s first score in the fourth quarter onslaught came one play after Butler blocked a Wilmington punt and recovered it at the Hurricane 30. Motter finished with 11 carries for 152 yards and the touchdown plus completed 7-of-15 passes for 84 yards. The teams traded field goals in the first quarter, a 23-yarder on Wilmington’s first drive by Brady Henry and a 33-yarder at the end of the first quarter by Butler’s Andrew Boren. It looked as if the Hurricane (1-2) would notch the game’s first touchdown early in the second quarter but turned the ball over on downs after three straight runs into the line and an incomplete pass. Wilmington had four plays from the Aviator 1-yard line but were denied a score. Chris Custis stopped Motter in the end zone for a safety two plays later and a 5-3 Wilmington advantage it’d take in to the intermission. Martin scored the first of his two third-quarter touchdowns on the Butler’s first drive of the second half to give the Aviators the lead for good. The Aviators have a quick turn around as they host The Team Across the Dam (Northmont) in a Thursday showdown as part of Fox 45’s Thursday Night Lights. Northmont comes into the game undefeated at 3-0 and has handled the Aviators with relative ease in outscoring Butler 83-13 over the past two season since the northern rivalry resumed. Butler will be without one of its prime offensive weapons after receiver Bryant Johnson (BJ) suffered a broken collarbone against Wilmington after catching one pass for 27 yards. “When you aren’t going into that game at full strength its going to be tough,” said Puckett. “BJ can help us both offensively and defensively. I don’t think that game is by any stretch unwinnable – we aren’t going to go lay down for them. Our kids will come out ready to go – we will be fight ready. RUSHING – WHS- Evans 12-58, Mayer 13-28, McIntosh 1-13, Rigling 1-4, Mitchell 1-0, Total 28-103. BUTLER- Motter 11-152, Martin 18-121, Akers 4-6, Casella 1-1, Total 34-280. PASSING – WHS- Evans 19-45 180. BUTLER- Motter 7-15 84. RECEIVING – WHS- Coomer 6-54, McIntosh 6-52, Mayer 2-24, Rigling 1-18, Camp 3-18, Mitchell 1-14. BUTLER- Ross 1-38, Johnson 1-27, Hendericks 2-13, Bennett 2-12, Martin 1-(-6). NEW CARLISLE — After a disappointing showing in Week 1, the Butler Aviators rebounded after a solid week of practice and came away with a dominating 49-28 win at Tecumseh on Friday. 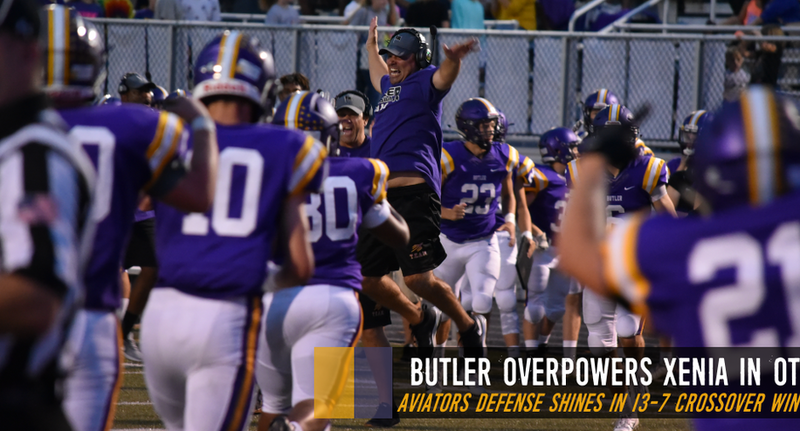 The win evened the Aviators’ record at 1-1 on the year and earned Butler head coach John Puckett his first career win as a head coach. After a scoreless first period, the Aviators punched it in three times in the second quarter to take a 21-7 lead heading into halftime. Tecumseh took a brief 7-0 lead with 9:25 left in the first half but Ryan Martin tied the game in a 10-yard run. Butler took the lead for good a short time later in an 8-yard touchdown pass from Mason Motter to Ryan Wilson. Andrew Boren added the extra point for a 14-7 lead that the Aviators would never relinquish. Jack Akers scored from a yard out with 0:17 left in the half to give Butler a 21-7 lead. Martin rushed for 107 yards on 16 carries while Motter gained 85 on the ground. Jack Akers had 57 yards on 17 carries and all three – Martin, Motter, and Akers, scored a rushing touchdown. Motter and Alex Joynes combined to complete 14-of-23 passes for 233 yards. Bryant Johnson caught nine passes for 157 yards and a pair of scores. Connor Hendricks caught one pass for 45 yards while Martin took one pass for 10 yards and Ryan Wilson caught one for nine yards and a score. After a long run the Arrows cut the lead to 21-14 early in the third period, but the Aviators responded with a drive that nearly ended in disaster but led to Butler extending their lead. A busted field goal attempt ended up with Alex Joynes finding Mike Masters for a touchdown pass that doubled up Tecumseh 28-14. The Aviators extended that lead to 35-14 on a touchdown pass from Motter to Johnson. The Arrows kept themselves in the game with a 92-yard kick return to cut the lead to 35-21, but Motter scored with his feet to extend the lead to 42-21. Motter hooked up with Johnson for another touchdown pass with just under a minute to seal the game and set the final score at 49-28. Puckett was happy with the way his team responded after a loss in their season opener. It doesn’t get any easier when the Aviators host Wilmington in their home opener in Week 3. The Hurricane come into the game 1-1 after a 38-7 win over Miami Trace on Friday. HARRISON — The Butler Aviators traveled to Harrison on Friday night to take on the tradition-rich Wildcats in the first of a two-game series. The Wildcats proved to be inhospitable hosts as they jumped out to a 14-0 lead in the first period en route to a 42-19 victory in the season opener for both squads. “I really like the way we competed in the second half,” said John Puckett, the Butler coach who made his head-coaching debut on Friday. Butler quarterback Mason Motter completed 9-of-20 passes for 159 yards and a pair of touchdowns, but the Aviator offense couldn’t keep up with the 547 yards of total offense posted by Harrison. The Wildcats dominated the time of possession by a more than 2-1 advantage while racking up 392 yards through the air and 155 yards on the ground. Harrison took the lead for good midway through the first quarter on a three-yard run by quarterback Connor Kinnett. Kinnett would go on to account for six touchdowns and a combined 467 yards through the air and on the ground. 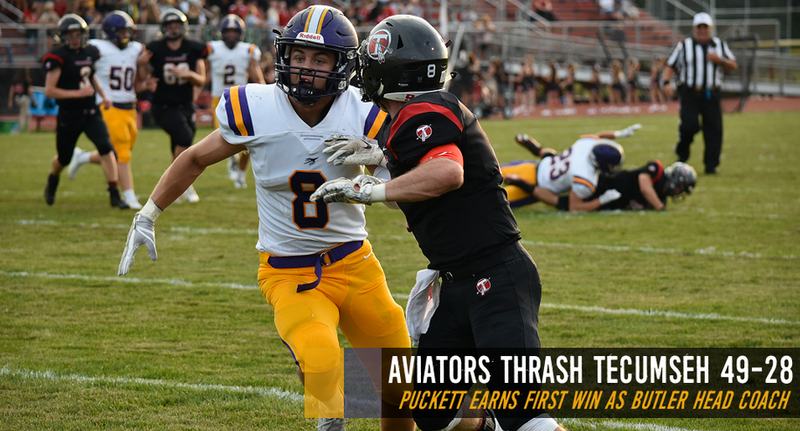 Puckett said Kinnett’s yardage wasn’t flashy and often came as the result of missed tackles by the Aviators. Levi Mitchell took a 26-yard scoring pass from Kinnett with 4:37 to play in the first quarter for a 14-0 lead and it appeared the Wildcats were in firm command. The Aviators struck back less than a minute later when Motter connected with Bryant Johnson for an 83-yard touchdown pass that halved Harrison’s lead at 14-7. The Wildcats scored twice more before intermission to take a 28-7 lead at the half. Harrison quashed any hope of a Butler rebound with another touchdown with 3:56 to play in the third period to take a 35-7 lead. Less than a minute later, though, Bryant Johnson returned the ensuing kickoff 77-yards and Ryan Martin finished off the drive with a two-yard touchdown run. Butler opened the final quarter with a 42-yard scoring strike from Motter to Ryan Wilson to get within two scores at 35-19, but Harrison tacked on another score with 5:08 to play that set the final score at 42-19. Ryan Martin led all rushers with 101 yards on 13 attempts for an average of nearly 8 yards per carry. Wilson caught four passes for a total of 63 yards and a touchdown while Johnson caught two for 86 yards and a score. Johnson also returned three kickoff returns for a total of 125 yards. Butler (0-1) will return to action on Friday with a road trip to Tecumseh, who is coming off of a 31-0 opening win over Fairborn. “I’m excited about this week,” said Puckett. “Tecumseh is much improved, they have a big back that runs the ball well, their offensive line comes off the ball well, they are a much better football team this year compared to last at least with that I’ve seen on film. But we can’t control that – we have to get off blocks better, we’ve got to get off the ball better. Butler and Tecumseh will get things kicked-off Friday night at 7:00 PM. VANDALIA — As the John Puckett era begins at Butler this fall, there’s a buzz of anticipation as the Aviators kick off the 2018 football season. Coming off a disappointing campaign a season ago that left the Aviators 4-6 overall and in fourth place at 2-3 in the Greater Western Ohio Conference American North division, there was a sense that something was awry. 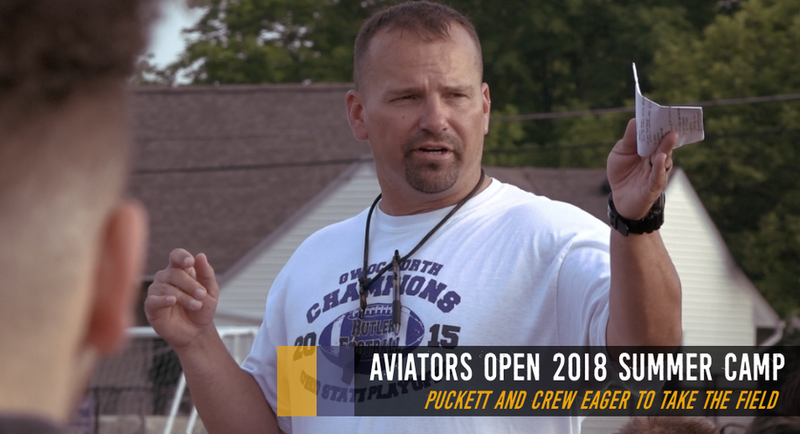 Enter Puckett with his “black flag” mentality and high intensity level and add in a talented, though thin football team, and the Aviators are looking to regain their footing after a pair of years not contending for a league title or playoff berth. Puckett’s impact was immediately felt in off-season workouts. He has learned a lot about his team. Puckett said he has learned things about coaching as well given this is his first head coaching job. He came to Butler as the defensive coordinator at Centerville and has also coached at Goose Creek High School, Hamilton, Richmond (IN), and Chaminade-Julienne. He was inducted into the CJ Athletic Hall of Fame in 2006. Puckett said Butler’s program is built on everyone – coaches and players alike – making a commitment to each other. Besides a culture shift, the Aviators also return a significant amount of talent and experience. Puckett said the key to everything is line play. Charlie Dent, Dillon Buchanan, Ben Sipos, and Jacob Calvert are expected to see the lions share of snaps on the offensive line. Calling the signals will be returning starter Mason Motter while Ryan Martin and Jack Akers will share the running back duties. Connor Hendricks and Nick Murphy will line up as slot receivers. “They both have pretty good speed, they are strong, they have good hands, and will get out there and mix it up blocking,” Puckett said. Deeper threats will be Bryant Johnson and Blake Ross. Alex Joynes will back up Motter while also seeing time at receiver. Luke Mitchell will play quarterback at the freshman level. Dent, Buchanan, Grant Grisez at nose guard, Jalen Applegarth, Sipos, Calvert, talented freshmen Ryan Logan and James Reid will all share time on the defensive line. Akers Bobby Buckler, who will play outside linebacker, will have a big impact according to Puckett. “Our two outside linebackers are long and athletic which is good,” he said. Key will be the play of inside linebackers Mike Masters and Nick Coyle. “Masters has tremendous instincts and a nose for the ball,” said Puckett. “He’s around it all the time. When the ball is snapped, he goes non-stop 100 miles per hour until the whistle is blown. Gavin Casella and Nick Murphy will play safety. Butler’s two corners are projected to be Alex Joynes and Cam Miller. Andrew Boren will handle most of the kicking duties including punts, extra points, and field goals. The Aviators will open the season on the road at Harrison, the first game in a two-year series. The Wildcats are a perennial playoff team and went 8-3 a year ago. Week 2 sees Butler travel to Tecumseh, a team they beat handily last year. Week 3 the Aviators will welcome Wilmington in the home opener and the next week The Team Across the Dam (Northmont) returns for a Thursday Night Lights televised game. Butler will host Xenia before opening the final year of GWOC play. League play will begin on the road at Greenville, then Butler will host Troy on October 5 for homecoming. Piqua will round out the home schedule before Butler travels to Sidney and Tipp City for the final two regular season games. Puckett believes the Aviators can be competitive with every team on their schedule. As a first time head coach, Puckett said that first Friday night will be special. 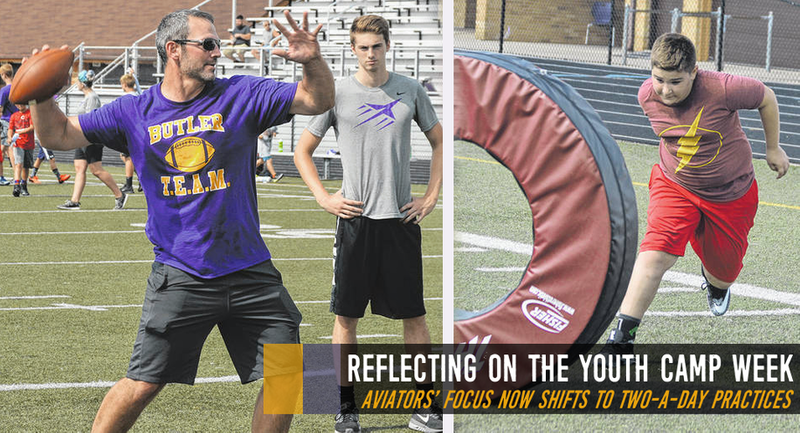 VANDALIA — The past, present, and future of Butler Aviator football met last week for the first Josh Betts Butler Aviator Football Camp. Nearly 60 Wee Aviators in grades K-8 joined current Aviators, the coaching staff, as well as Butler standout Josh Betts in four days of instruction and fun. Under the direction of coach John Puckett, athletes were exposed to nearly every position on the field. Those talks covered effort, attitude, hustling from one drill to another, being coach-able, keeping grades up, and responding the right way to winning and losing. Betts said that with young children and professional commitments, its hard to get back to Vandalia as much as he likes. The football camp was a way to come back and give something to the program. Puckett said having Betts at the camp was a great addition, especially considering he was driving from Columbus each day while balancing work commitments. “His energy level was to another degree – the guy is contagious,” said Puckett. “The kids, little and older, wanted to be around him. People just gravitate towards him. His knowledge of the game, especially the quarterback position, is just amazing. He learned behind Peyton Manning, Ben Roethlisberger, his football knowledge and IQ was off the chart. But one of the things he impressed me the most was when he talked to the kids about the importance of their grades. The Aviators will now turn their focus to two-a-day practices that begin on Monday, July 30. CENTERVILLE — Butler’s new football coach is nothing if not intense, and that high-energy style is taking hold over the Aviator football program. Last week the Aviators hosted Springboro and Northridge for a 7-on-7 competition and traveled to Centerville for a joint practice and 7-on-7 that lasted nearly four hours. 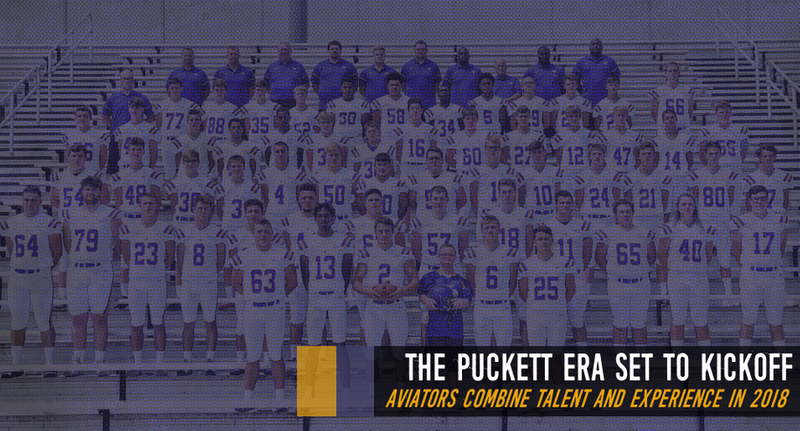 Puckett, who was defensive coordinator for the Elks prior to taking the top position at Butler, said working with and competing against historically successful programs will make the Aviators better. Centerville was 10-2 a year ago which included a 35-0 win over Hilliard Darby in the opening round of the playoffs. Puckett has learned a lot about the team since being named the head coach through weight lifting during the spring and summer workouts. Each of the Aviators wore a practice jersey that featured a black flag which Puckett uses to evoke the spirit of pirates. During a team meeting in January he explained his philosophy of the team’s “black flag” honor which will be awarded to one defensive and one offensive player each week. The Aviators will take that fight on the road for their first two games. Butler will travel to Harrison High School on Friday, August 24 to open the season and then travel to Tecumseh on Aug. 31 for Week 2. Butler will host Wilmington on Sept. 7 in their home opener in the Blake LaForce Play for a Cure game. Week 4 will see the Aviators host the Team Across the Dam (Northmont) in a Thursday Night Lights tilt on Sept. 13. They will then host Xenia on Sept. 21 before opening the final season of Greater Western Ohio Conference play at Greenville on Sept. 28. October brings Troy to town for Homecoming on Oct. 5 and Piqua will visit on Oct. 12. Butler closes the regular season with road games at Sidney and Tippecanoe. VANDALIA - The Aviators opened up camp Wednesday morning, kicking-off the first of several scheduled summer camp days. While practices officially begin around the state on July 30th, the time together allows the team an opportunity to condition and work through fundamentals as a unit. It's time that is especially important for teams like Butler, who are opening the 2018 season with a new coach. While Head Coach John Puckett has been in his post since January and has spent the offseason with the team, the on-field time is invaluable. It was in his initial meeting with the team back in January that he declared, “We will be relentless competitors,” Puckett said. The process which began in the weight room over the winter has officially transitioned to the field and Puckett was encouraged by the progress. "Our guy's toughness, effort and attitude was very intentional today," said Puckett. "We were able to practice with a purpose." The practice was what you would expect to see in early June, with flashes of greatness and opportunities for continued growth. For Puckett and the Aviators, a strong senior class has helped model the way through the offseason and Wednesday was no different. "The leadership of our seniors was tremendous today," said Puckett. "Because of that, we got better as the day went on and that's exactly what you want to see."